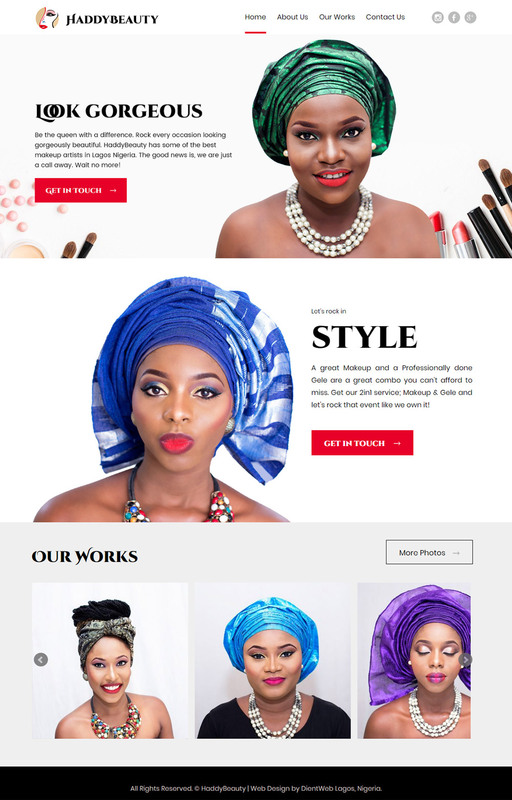 A Mobile Responsive CMS Driven Website Design for a Makeup Professional, a showcase of Beauty and Excellence in Craft. HaddyBeauty is one of Lagos leading Makeup and Gele services provider. Her services are simply Makeup and Gele hence the need to spell them out in an attractive, subtle but clear manner. DientWeb knew just how lovely images can be when it comes to showcasing crafts and employed the power of photography to tell the HaddyBeauty story. Of course, the resulting website is classy, modern and beautiful. See some of the screenshots below and visit www.HaddyBeauty.Com for more.